In comics, the assembling of a team of heroes is not a new concept. But what if those "heroes" had been rejected for having lame powers? Valiant addresses this question in the fantastic new mini, Secret Weapons #1, starring Amanda McKee - the technopath codenamed Livewire. Academy Award-nominated screenwriter Eric Heisserer (Arrival) and Harvey Award-nominated artist Raúl Allén (Wrath of the Eternal Warrior) have given this band of misfits a new life under the leadership of Livewire. What could have been treated as a parody is handled with great care and love as these psiots that Toyo Harada had stashed away after drawing out their powers but considered useless have found a new purpose.It's another great entry point for new readers and a rewarding one for longtime fans of Livewire and the Unity series. Harada stashed Nicole (can speak to birds), Martin (can make inanimate objects glow), Owen (spontaneously summons a random object at any given time) and three others in a facility known as the Willows. When a recent attack leaves the place in shambles and all the misfit psiots missing, Livewire begins to seek them out. Unbeknownst to them, a new threat emerges when a mysterious monster is unleashed and on the hunt for the same psiots. Livewire has to find them in time while also keeping them safe. It's a straight-forward concept that harkens back to Marvel teams like 'New Warriors' but this is the beauty of Valiant, it values not only the front-line powerful heroes but finds room to tell the stories of lower tier heroes too. There is plenty of heart and character development that takes place that makes characters like Nicole endearing and empathetic. The struggle to find your place in a world that doesn't value who you are is universally relatable. Heisserer paces the story with just the right beats, allowing scenes to breathe and sink in. The diversity displayed on the page mirrors the real world which makes Secret Weapons an inclusive story that will have you rooting for the underdogs. The backstory of Harada's experiments and what lead to the present is concise and brief giving the reader plenty to go on. This is the kind of story you can easily slip into like a pair of silk pajamas. Raul Allen and Patricia Martin work in unison to bring some marvelous art. Allen's designs are detailed but with a soft touch, not too heavy-handed with the line work and the layouts flow nicely with the eye of a cinematographer using varied angles and scope. He takes what could have been a troublesome and intricate monster to illustrate and makes it look easy. The action sequences are never too busy or unclear. It's a testament to his patience and attention to clean pencils. The efficiency with which he smoothly transitions from scene to scene keeps the momentum going even when the characters stop to talk. Martin's colors rest on a distinct palette of purples and pinks help set the mood. It's a shame that Secret Weapons is only a 4-issue limited series. After one issue I'm ready to follow Livewire and these underestimated kids into the battle. I want to see just how they'll work together using their very unique skills. Livewire seems like the perfect leader to bring them together and encourage their development. Not surprisingly, Heisserer captures the emotional heart of these unwanted heroes and makes us care about them. It's easy to root for the strongest, fastest, most dominate superhuman in a cape but it takes a special skill to make this band of misfits endeared to the most cynical of comic book fans. 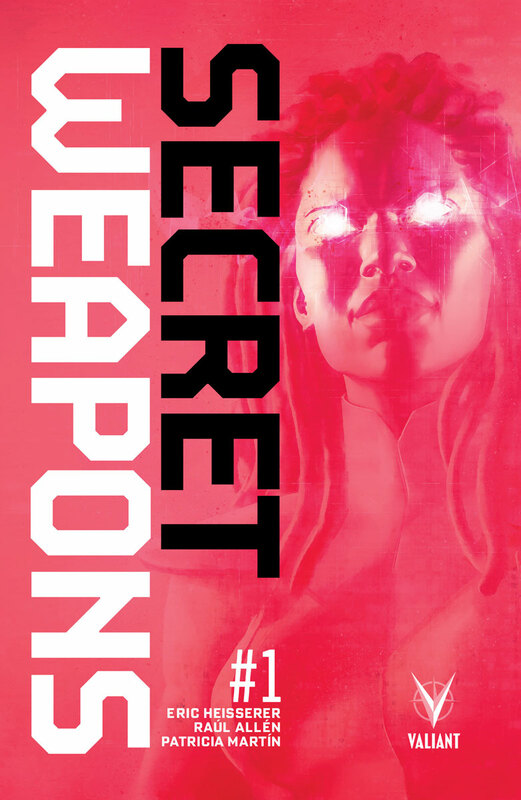 Secret Weapons #1 is another winner for Valiant with a beautifully told and illustrated debut that speaks to the heart of what makes a hero a hero.